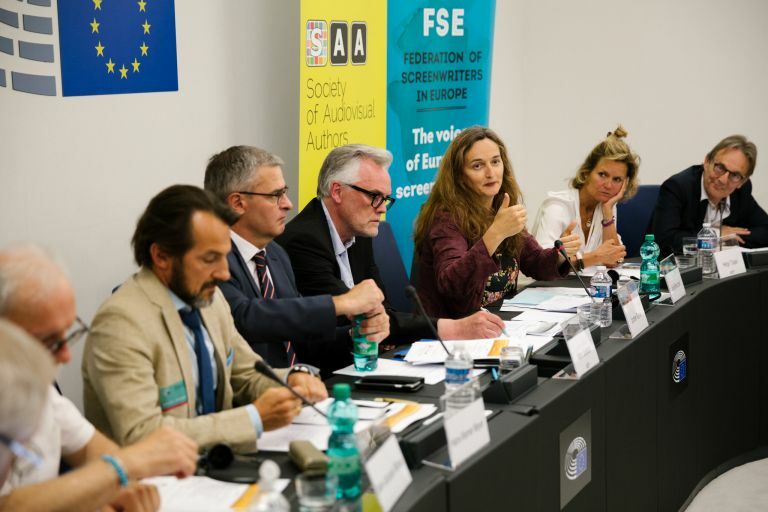 Eight prominent screenwriters, directors, singers and actors attended the European Parliament in Strasbourg; the eventwas co-organised by SAA in partnership with several representative organisations of performers and audiovisual authors. It was hosted by MEPs: Mary Honeyball (S&D, United Kingdom), Marc Joulaud (EPP, France) and Helga Trüpel (Greens/EFA, Germany). Julie Bertuccelli (French screenwriter and director) pointed out the need for mutual respect between producers, on-demand platforms and audiovisual authors. The platforms would not exist without its creators, and at the same time the works are made visible thanks to them. Netflix and the collective management organisations have established a fair agreement for the share of profit in France. For this to work in other countries, European legislation is needed, said Ms Bertuccelli. Paola Randi (Italian director and screenwriter) explained that it takes several years to develop a project, but it is only during the shooting period (which only lasts a few weeks) that the director is being hired. All the development years before, they have neither employment rights nor pension. Both Ms Randi and Ms Bertuccelli testified that the situation is worse for women; there is a gap in terms of payment, budget and size of projects, which unfortunately discourages young women who want to pursue a creative profession. “The German audiovisual industry is worth 8 billion euros, but audiovisual authors earn less and less money. I used to live from royalties, now you can see my movies on YouTube and I get nothing” explained Jochen Greve (German screenwriter). If authors’ income continues to decrease, the market will disappear, especially in small countries were the market is already limited. Murray Head (British actor and singer) noted how he used to invest the royalties from his former albums to develop a new one. Today, touring is the only way to make money to pay the bills, but it is not enough to make a new album. Hans Werner Meyer (German actor) explained that contractual freedom and transparency, as provided for in the draft Directive, is not enough for artists. There is no way to negotiate with producers and platforms. The only ones that can use a contract adjustment mechanism are those who plan to retire, because they get blacklisted. Support of the words of these authors and performers is provided by two recent studies: a legal study about audiovisual authors’ remuneration right by CISAC and the study about screenwriters and directors’ remuneration by FERA and FSE. Furthermore, more than 16.400 petition signatories from over 100 countries are backing up 126 screenwriters and directors calling for fair remuneration to be included in the new Copyright legislation. “European authors are counting on you!” said Costa-Gavras (French/Greek screenwriter and director). Indeed, it is even more imperative that the European Parliament includes this unwaivable right to remuneration for on-demand exploitation in its position, as the EU Council overlooked it when finalising its own agreement. If not, the right to fair remuneration of audiovisual authors will be left out of the most important piece of EU legislation for creators this decade, and they will be left behind in the digital era.